An overview of the ranges of behavioral improvement before and after services. When your child comes into our program their CAFAS assessment scores tend to be elevated, reflecting a need for intensive services. As your child progresses through treatment and develops the skills they need to stay safe in their homes, schools and communities, their CAFAS scores decrease. The decrease in score reflects improvement in daily functioning. CAFAS assessments are conducted at intake, every three months during your child’s stay and at discharge. Below you will see the average admission CAFAS scores for youth served FY14 through FY18 followed by their discharge scores. As you can see, youth that complete our program leave with significantly lower CAFAS score than when they arrive, indicating improvement. The Outcomes Management Program includes a voluntary post-discharge survey which we conduct at 6, 12, and 18 months after a youth has discharged from our program. 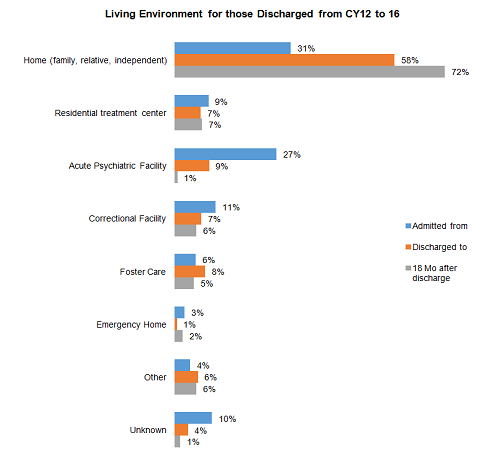 In the graph below, you can see where the youth that participated in the post discharge surveys admitted from, were discharged to, and lived 18 months after their discharge. Most youth involved in the survey were living at home with family or independently at 18 months after discharge. Of the youth and families that participated in the post discharge interviews, the chart below shows the rate of youth that are now displaying minimum to mild impairment in the listed categories 18 months after discharge. Example for clarity: 88% of youth maintain improvement in their behaviors at school, 83% are maintaining a C or higher, etc. 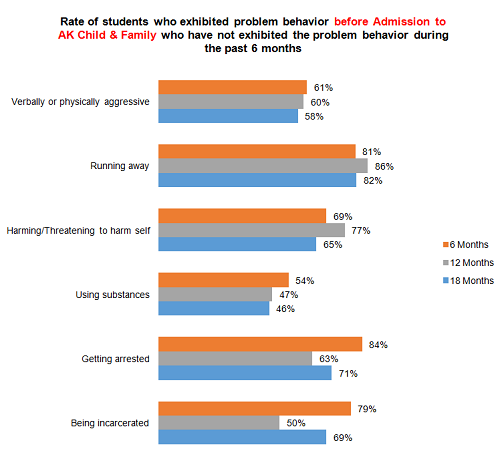 When youth enter treatment at AK Child & Family, they present with various high risk behaviors that impact their lives at home, school and community. Youth represented in this graph are no longer engaging in the high risk behavior they admitted with at 6, 12 and 18 months post discharge. Example for clarity: Of the youth that came in with issues of being verbally and physically aggressive, 61% of them were no longer displaying those behaviors at 6 months post discharge, 60% were no longer displaying those behaviors at 12 months, etc. In addition to CAFAS scoring, we track the average lengths of stay in our programs. 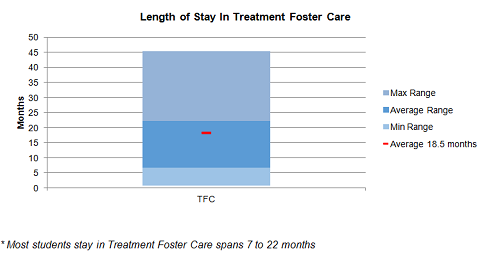 You can anticipate that your child’s treatment stay would fall somewhere within the below ranges, however it should be noted that length of stay within a program is determined by the individual’s progress towards treatment plan goals and objectives. 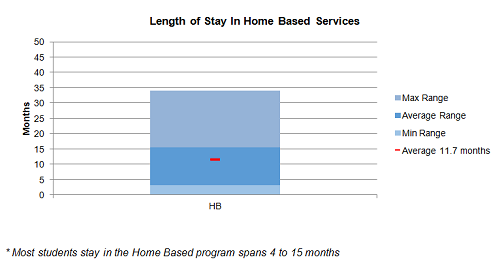 The below graphs represent the range of the lengths of stay for youth from FY 2014 trough FY2018 in various programs. 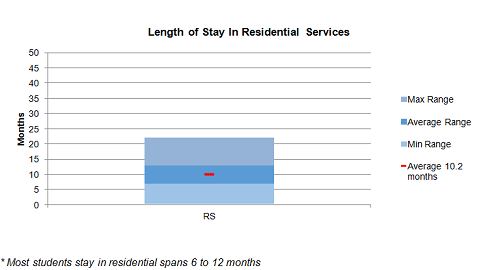 The average length of stay is represented by the red point identified within the range.